Newcastle upon Tyne (often shortened to Newcastle) is a city and metropolitan borough of Tyne and Wear, in North East England. Situated on the north bank of the River Tyne, the city developed in the area that was the location of the Roman settlement called Pons Aelius, though it owes its name to the castle built in 1080, by Robert II, the eldest son of William the Conqueror. The city grew as an important centre for the wool trade and it later became a major coal mining area. The port developed in the 16th century and, along with the shipyards lower down the river, was amongst the world's largest shipbuilding and ship-repairing centres. These industries have since experienced severe decline and closure, and the city today is largely a business and cultural centre, with a particular reputation for nightlife. Like most cities, Newcastle has a diverse cross section, having areas of poverty to areas of affluence. Among its main icons are Newcastle Brown Ale, a leading brand of beer, Newcastle United F.C., a Football League Championship team, and the Tyne Bridge. It has hosted the world's most popular half marathon, the Great North Run, since it began in 1981. The city is the twentieth most populous in England; the larger Tyneside conurbation, of which Newcastle forms part, is the sixth most populous conurbation in the United Kingdom. 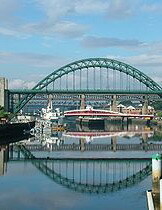 Newcastle is a member of the English Core Cities Group and with Gateshead the Eurocities network of European cities. The regional nickname for people from Newcastle and the surrounding area is Geordie. 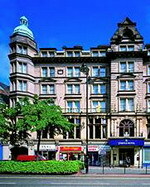 Like the city itself, the County Hotel, formerly known as Thistle Newcastle, is a fascinating mix of old and new. Directly opposite the central railway station and in the heart of the city, the hotel is a Grade II Victorian Listed building, which has been sympathetically restored and brought right up to date. Conveniently located opposite Newcastle Central and Metro rail station and only 8 miles from Newcastle Airport, the County Hotel is an ideal venue to hold your conferences and business meetings, offering 8 meeting rooms, the largest seating up to 180 people theatre style. The hotel has 114 bedrooms, including Executive rooms, as well as Junior Suites making us a very popular choice for weddings or special occasions. Plus we have our own on-site car park available on a first-come-first-served basis at an additional charge. 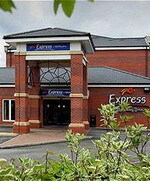 The Express by Holiday Inn Newcastle Metrocentre is a modern designed hotel located ideally just off the A1. Guest rooms accommodate upto two adults and two children and include free continental breakfast and free parking. Express by Holiday Inn Newcastle Metrocentre is situated in Newcastle Upon Tyne and is only a short distance from Gateshead, Sunderland and Durham making us an excellent choice for a stay in the area or a stop of when on your travels. For the leisure traveller the hotel is situated a short walk from the Metrocentre shopping complex, one of Europes largest shopping centres, Newcastle city centre is only 3.5 miles away from the hotel and the Newcastle Nightlife is a must see for any party goers. The citys many attractions also include Newcastle United Football Club, Metro Radio Arena and of course the famous Tyne Bridge and the Gateshead Millenuim Bridge. 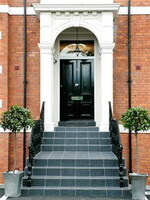 Kensington House Aparthotel is a luxurious mix of 23 serviced apartments, conveniently located in Newcastle's leafy and cosmopolitan suburb of Jesmond. Every spacious apartment is individually and imaginatively designed, and furnished to the highest standards with impeccable taste. Newcastle's vibrant city centre is only a stone's throw away and there is easy access to rolling hills and historic coastline, making Kensington House the ideal location for all your needs. Whether you are looking for a weekend retreat with a difference or somewhere to stay whilst on business, Kensington House Aparthotel won't let you down. A vast array of shops, restaurants, bars and attractions are only a short walk away in the heart of Jesmond or in Newcastle city centre. There are award-winning golf courses almost within reach of a 5-iron, and ample opportunities locally for traditional country pursuits. Novotel Newcastle Airport offers state of the art facilities with stylish new design. Located 5 min drive from Newcastle International Airport now offering shuttle service and flight information screen. 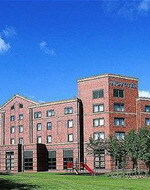 126 en suite rooms including accessible rooms andinternet. Elements Bar and Restaurant. Ideally placed for conference and events with 8 rooms (200 persons) and leisure suite with indoor heated pool, sauna, gym. Easy reach of city centre night life, Metro Centre shopping and the Northumberland coast. From breakfast to lunch, dinner or a tasty little snack, Novotel provides balanced choices and à la carte service 24/7 at all its hotels. At Novotel, you can count on enjoying a relaxing meal in a friendly, stylish setting. With its stylish and contemporary design, Elements bar and restaurant offer an innovative dining experience allowing guests to choose between modern dishes and old favourites, across appetisers to entrees to main courses. 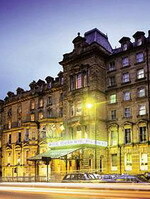 Situated in the heart of the bustling city of Newcastle upon Tyne, the 3 star Royal Station Hotel combines elegant Victorian architecture with up to date facilities and takes pride in offering a courteous and friendly service. Opened by Queen Victoria and Prince Albert in 1858, the hotel has been recently refurbished to a very high standard and now features 144 spacious en-suite bedrooms, a choice of 10 versatile Conference Suites the largest of which can accommodate up to 200 delegates, wireless high speed Internet in all areas, a Leisure Club with an in-door swimming pool, Jacuzzi, steam room and cold plunge pool as well as a fitness area and the popular Destination Bar. Conveniently located, adjacent to Central Station the hotel is the ideal base for exploring Newcastle upon Tyne whether visiting on business or pleasure. Situated on the cosmopolitan Quayside with views of the River Tyne and its famous bridges, the Copthorne Hotel Newcastle is perfect for both business and pleasure with easy access to air, rail and road. 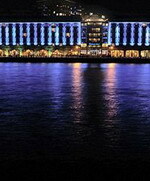 With a location as attractive as it is convenient, take a walk along the historic waterfront. Within walking distance is the Baltic Art Gallery, Sage Gateshead Music Venue and St James Park - home to Newcastle United Football Club. In close proximity is the stunning Northumbrian coastline, Hadrian's Wall and the Stadium of Light - home to Sunderland Football Club. Quay 7 Bar is the ideal place to relax with colleagues or family and friends. Try our cocktail list designed by our Bar Team, sample any one of a number of wines from around the world, or indulge in our excellent bar menu. There is something for everyone's taste. Fancy sitting outside? Why not watch the world go by whilst sitting on our outdoor terrace located on the Quayside, with panoramic views of the River Tyne.